The year is 1968. 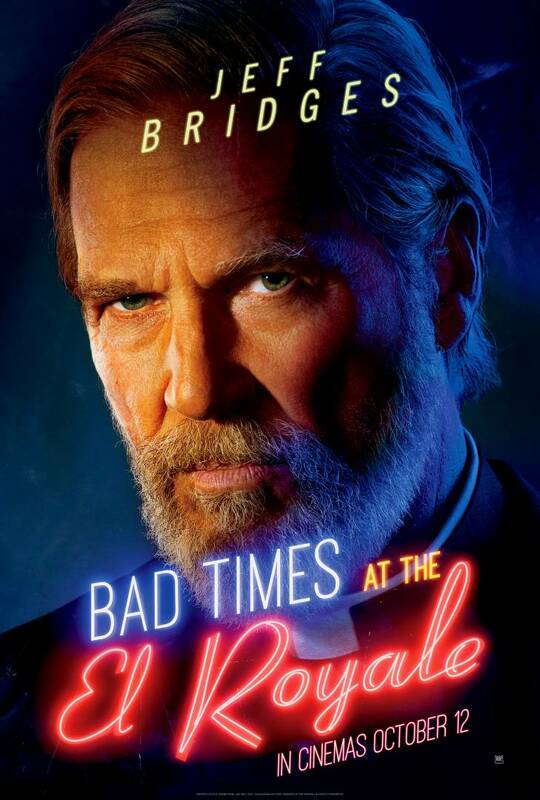 Five strangers are looking for a night of redemption; a cleric, a soul singer, a traveling salesman, two sisters and a priest have just checked into Lake Tahoe’s El Royale. It is a rundown hotel run by a manager with an equally dark past. The stranger’s night takes a shocking turn as cult leader, Billy Lee, shows up looking to cause some trouble. This movie has stars such as: Chris Hemsworth (Billy Lee), Dakota Johnson (Emily Summerspring), Cailee Spaeny (Rose Summerspring), Jon Hamm (Seymour “Laramie” Sullivan), Jeff Bridges (Father Daniel Flynn), Cynthia Erivo (Darlene Sweet), and Lewis Pullman (Miles Miller). The film starts off with a mysterious atmosphere as the hotel guests are checking in, which immediately draws the viewers in. The 60s setting is on display with all the decorations in the shady venue creating a groovy vibe. To add, the whole concept of there being a peculiar hotel right on the border of Nevada and California added an entertaining element to the overall storyline. Each character is remarkable in their own way. They all have an edge to them that makes them stand out. They contrast with well with each other because of their differences. For example, with Seymour (Hamm) being an old-fashioned traveling salesman and Emily (Johnson) being a hippy renegade who does whatever she wants. With that being said, though, the characters have their differences their similarity is their want of redemption. The movie intrigues viewers by having a set of flashbacks that delves into each character’s past while still tying it back to the present. The character’s past explains their motives for their actions and shows the struggles that each of them face — nobody was ever as they seemed to be. I particularly enjoyed how the film would focus on one moment and expand on it over and over again through the different perspectives of each character. With each time repeating, the viewer learned more information than the last. The standoff at the end of the movie with the psychotic pedophilic cult leader, Billy Lee (Hemsworth), capturing all the guests and playing roulette on which ones he would kill and which ones he would let live was very unnerving. This film is bound to be memorable for those haunting scenes alone. This was a movie that if viewers left all during any of it they would be so confused on returning since every minute was filled with dramatic reveals and new information. The acting was fantastic and very emotional; viewers could really emphasize with the characters, even though most did bad things they weren’t bad people. The ending was very strong and impactful and almost had me tearing up. Every second of this film kept viewers on their toes. You didn’t want to miss a moment. Overall, this movie is very intense and dramatic. It is a thriller that everyone should see.